Eye-catching solar structures by [CED Member] Spotlight Solar have been installed in front of a new LEED Platinum school, highlighting leadership in green building with solar design. Chapel Hill, NC (PRWEB) May 07, 2013- Spotlight Solar has announced the installation of its striking solar design structures at a new school pioneering the latest in green building techniques. The school will go beyond net-zero energy by making more energy than it uses. Sandy Grove Middle School will open this year as the nation’s first net-positive energy, LEED Platinum, leased public school. 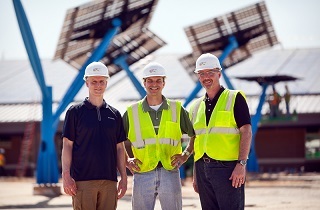 Four striking solar energy systems made by Spotlight Solar will highlight the environmental leadership of this school and inspire smart energy choices in the community. 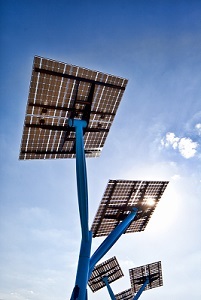 Each of the bright blue Spotlight solar structures stands 20 feet tall, and incorporates 12 solar panels. They are the most visible part of the school’s 590 kilowatt photovoltaic solar system, contributing a meaningful 12kW, more than enough to power the three electric vehicle charging stations at the school. In combination with a geothermal system, advanced building techniques, and high-efficiency LED lighting, the school’s solar system will produce 20% more energy than the school requires. Surplus energy will be contributed to the Hoke County energy grid in partnership with Lumbee River EMC. The eye-catching Spotlight Solar structures complement this clean energy leadership and give it visible expression. Sandy Grove Middle School is a result of a pioneering approach led by FirstFloor / SfL+a Architects, which created a complete package of design, development, renewable energy, and public-private financing. Metcon, a member of the US Green Building Council is the general contractor. Together, the partners in this project will provide the residents of Hoke County with a flagship school while saving $35 million over 40 years. PowerSecure Solar provided installation and engineering services for the large rooftop solar system, a whole-building generator, and the Spotlight Solar design structures. Blair Kendall, Director of Business Development for PowerSecure said, "FirstFloor has led with a vision for the future of net-positive schools nationwide. We are privileged to collaborate with Metcon and other partners to provide renewable energy and peak-shaving capabilities to a complex and complete green building solution. The Spotlight Solar trees are an inspiring capstone on the tremendous achievement of this project – they place clean energy right among the students in a beautiful way." Sandy Grove Middle School is under construction now and scheduled for completion by July 30. The pioneering green building will be ready to receive new students for the start of the 2013-2014 school year. SfL+a Architects is a firm designed to provide state-of-the-art architectural solutions to educational institutions. Founded in 1982, the company has emerged as one of the most highly regarded architectural firms in the Southeast, offering expert services in architectural planning, design, construction, land planning and interior design. The firm has offices located in Raleigh, Fayetteville and Charlotte, N.C. The sister company of SfL+a Architects is FirstFloor K-12 Solutions, LLC, a North Carolina development company pioneering public-private partnerships to develop educational facilities. The company is comprised of talented professionals, each possessing 15-20 years of experience in banking, finance, construction and property management. For more information, visit http://www.sfla.biz. Schools are an excellent place to use solar energy. For one thing, they're open during the day -- when the sun is out and when it's possible to get the most benefit from its power. And by showing solar power in action, schools can help educate the rest of the community about the benefits of this pollution-free energy source. If you took a loan to pay for these improvements, the interests you paid are deductible. Also, if your home improvement is only repainting the house, it is not considered home improvement and you cannot add the costs to your adjusted basis regarding capital gain taxes. That is really a great thing. I would like to tell that I have recently came across a site called the spinnaker group inc who is providing the service in leed consulting, green building sustainability etc.